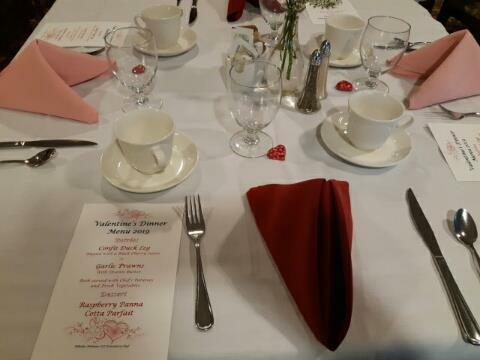 A few times a year we have a very special dinner with our residents – a Candlelit Dinner in December, a Mother’s Day Dinner and Valentine’s Dinner. For these occasions, we break with the norm and order linens for the tables, flowers, chocolates for each place setting and have a menu printed up for each table. The menu, which is always excellent, is bumped up a notch or two as well, and wine is served for those who would like it. Everyone enjoys the extra fanfare – staff setting the tables have fun preparing for the event, residents get dolled up in their fanciest clothes, the cooks work so hard to prepare a fantastic meal, and there is a generally festive atmosphere. The gasps from the residents and their guests when they walk into the beautiful room are so heartwarming to hear and certainly makes all the extra work worth every second. A special place called home? I honestly don’t think we could do any better than that. There are times when parents need to make difficult choices. Choices about schools, caregivers, access to digital media, or diet. The decisions are pretty much never ending – some easier than others, but always more to be made. For many of our families, the decisions are often either/or decisions. Do I buy fresh fruit or pay for my child to go on a school field trip? New shoes or cold medicine for the 5-year-old? A bus pass to get to work or a birthday present for the 10-year-old? These are hard decisions in the no-win situation of living in poverty. Recently one of our families had to make an extremely difficult decision. Would they pay for childcare for their child with special needs OR pay for essential medical care for their other child that isn’t covered under our medical services? How does a parent choose between the real and significant needs of their children? It is in situations like this that we are grateful and honoured to be able to step in and offer a helping hand. Supporting that family with the costs of medical care was an obvious solution that would help both children get what they need and remove the stress of financial worry from the parents. In the grand scheme of things, it wasn’t a massive amount of money – but it had an enormous impact on that family. Being able to share our resources and offer support to people in need is just one of the things that The Cridge Centre does with a great deal of joy and gratitude. To support any of The Cridge Centre programs click here. Imagine leaving your war-torn country, your extended family, your home and job – leaving it all to hope for a better life here in Canada. Imagine travelling all that way with two small children, unsure what you were travelling towards, but hoping for safety and security. Imagine struggling to learn a new language and culture, all while looking for housing, schools, and a place to belong. Imagine that a year or so later, just when life starts to feel almost normal again, you start to notice angry looks from your neighbours and a sense of animosity from your landlord. He says that your children are too noisy and that you need to look for a new place to live, in a city where there are few affordable units for a family of 5. Imagine the fear and stress – not knowing if you and your family will be homeless and insecure again. This is a story that we have heard on more than one occasion – families facing immense stress as they try to rebuild their lives in Victoria. We see fear, isolation and hopelessness in their faces as they struggle to overcome all the barriers that are facing them. One of our families came to us with this need in November. They were desperate and afraid, not sure who to turn to for help. As we worked through the issues with them, we realized that in the midst of the stress of dealing with housing, they were not going to be able to provide a Christmas for their children. Enter in an incredibly generous family, committed to making Christmas special for one of our families. This family had decided to forgo giving gifts to each other, and instead provide gifts for a family in need. And provide they did! In an incredible outpouring of generosity, they bought gifts for the children and parents, gift cards for stores and services – even a gift card for a local restaurant so that mom and dad could have a date night. They came with boxes of treats and wrapping paper and bows – everything packed with love and care and words of support. We were honoured to receive this bounty from the donor and then to pass it on to the family. It was an experience of pure joy for us to see the generosity of the donor and the immense gratitude of the family. There were tears, wonder and humble gratefulness from everyone concerned. And that is what Christmas is all about. To become a donor click here. Somewhere along the line, our family stopped having fun together because it was very hard to actually have fun. Outings always seemed to end up in disappointment, tears, and tantrums. Picnic at the beach? Pass. Family birthday dinner? Sorry, we are “busy.” Check out the cool new exhibit at the museum? Yah, no. I wondered, what would it be like to go to a family dinner and not have to leave early because we pushed the envelope too hard and Evan was DONE and having a melt-down and Alex was in tears over leaving before birthday cake and presents? What would it be like to go to the Fall Fair and see both kids get to enjoy the day in the way that worked for them? What would it be like to pack a picnic, get kids ready, enjoy the day and get home all without becoming so exhausted and stressed that I wanted to cry? I realized I was envious of families who have fun together. 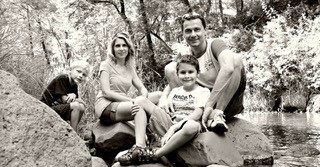 To me, a family who had fun together was a family who was thriving, and I saw our family as just surviving. Then the workshop leader challenged us to brainstorm how we could make our dream vision of respite possible. Today, respite looks a lot different for our family. My husband and I still take time as a couple, and we schedule in some alone time now and then. But we both agree the best “rest” we get is fun together with our kids. We have a respite care provider, Karen, who helps us with the preparations, so we aren’t done before we’ve begun. Karen comes to family parties and helps our son manage the busy, loud environment, and if need be, takes him home early allowing us to stay longer if we want to. Last month we went to the Fall Fair, and Karen made getting ready and out of the house a breeze. We looked at the animals together, then Karen and Evan went home for a few hours of quiet time while we did the midway rides with Alex. Karen and Evan came back for dinner and some music in the evening. It was such a great day for all of us – we had FUN TOGETHER! To learn more about Respite Services and ways to support the program click here. I have worked with children with special needs for over fifteen years. I have worked in traditional classrooms, Reggio Emilia classrooms, in the schools from kindergarten to grade twelve, and in daycare. Five years ago, The Cridge Centre for the Family’s Preschool program transitioned from a traditional indoor program to a nature-based one. I will admit that I was skeptical regarding what this transition would mean for the children with diverse abilities that I work with. This is what I have discovered. 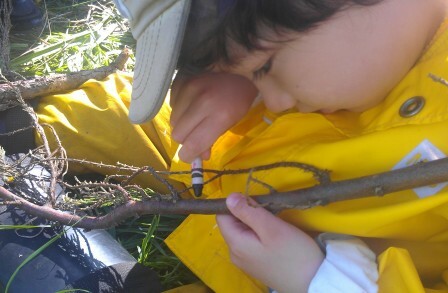 In Nature Preschool we have taken the idea of play-based learning to the extreme. We believe in long periods of free and uninterrupted exploration. It allows the children with diverse abilities take the time they need to work on the skills that they find difficult while engaging with their friends and enjoying the play. I had one student that was working diligently on his fine motor skills. In his intervention program, he would be working with a crayon and paper but very much disliked the activity. In Nature Preschool, he sought out opportunities to colour and paint on vertical surfaces, namely the sides of rocks and decorating trees. Same skill — a different level of enjoyment. Another child worked with his physiotherapist to learn how to walk up and down the stairs, whereas at Nature Preschool this child developed core muscle strength by regularly walking up and down large rocks. Lastly, I believe the most important things that happen in Nature Preschool are the friendships. When children are enjoying fresh air and sunshine, exploring the world in a way that is meeting their individual needs their social interactions are effortless. Kids talk more when they are moving. They cooperate when they have to accomplish difficult tasks. I see so many more friendships develop while working in Nature Preschool compared to any other class I have worked in before. The children treat each other as equals. Differences in abilities disappear. It is heart-warming! https://cridge.org/wp-content/uploads/2018/08/DSCF1415.jpg 3456 4608 Marina Bazalitskaya http://cridge.org/wp-content/uploads/2015/06/cridgelogo-colour3.png Marina Bazalitskaya2018-08-29 20:01:492018-08-30 14:25:57Go Play Outside! I wanted to check-in early, but my son’s inhalers are suddenly MIA – missing in action. There is no way I can leave him with a babysitter overnight and not have at least two on hand. So maybe the hotel will offer a late check-out? I make the required trip to the pharmacy. The list of necessary reminders is on the fridge, I have also texted the list to Amanda, but the handwritten one on the fridge is the back-up in case her phone battery dies. I’m all about the back-up, I have Plan B’s for everything. The list is next to the list of primary phone numbers for her to call if she needs help, but mine is the one at the top, and to be honest, I want her to call me first. I must be there if my son has a problem. There is a good chance that I will get called and need to come home. John’s dinner is in the fridge, along with snacks, breakfast, and tomorrow’s lunch. I know that Amanda could prepare it for him, but I just have not had the time to show her how, so I did it last night at around midnight. John has so many life-threatening allergies and food aversions that crafting the meals he needs is time-consuming and challenging. He has a gruelling surgery in three weeks, and it is important that he does not lose any more weight. I am so pleased that John is crazy about Amanda! For the first time since his 6 month stint at Vancouver Children’s Hospital 2 years ago, he is ok with being away from me overnight. Being a single parent means that I am always “on duty.” Being John’s single parent means I am responsible for keeping him alive. It sounds dramatic, and of course, all parents are responsible for keeping their kids alive. For John and I the difference is that his allergies could kill him, an asthma attack could kill him, a seizure could kill him. He needs constant vigilance, medications & interventions to prevent his death – 24/7. A soft knock at the door and Yay! Amanda has arrived! John looks at me, and we communicate without words, I kiss his forehead, “love you,” I say. Ten minutes of chat with Amanda later and I am in my car. No phone call comes from Amanda. I sip red wine in a bubble bath, I watch a movie, I remembered my toothbrush, I read my book. Best of all, I sleep all night with no interruptions in a king size bed with fresh sheets. I open my gift basket and play solitaire with a deck of cards, I eat one of the Rogers’ Chocolates – maple nut. I sleep in and order room service breakfast; they even put a rose on the little service table. I read some more, I call home, everything is fine they tell me, they are having fun, don’t rush home. I check-out early in the afternoon and drive home, stopping for gas and groceries. I plan to make a favourite of John’s for dinner, it’s one of my favourites too. It was only one night, but I feel refreshed and ready to face another day… week … month of caregiving for my precious son.